FRANKFURT, Germany — The former president of the German football federation has accused his successor of lying, saying there was definitely a slush fund used in Germany’s successful 2006 World Cup bid. Theo Zwanziger told Der Spiegel weekly that his successor Wolfgang Niersbach must have known about the secret money for years. Der Spiegel reported a week ago that a slush fund of 10.3 million Swiss francs (about $6 million at that time) was set up to buy the votes of four Asian representatives on the FIFA executive committee. Niersbach has denied any vote-buying and said the money was used to a payment to FIFA two years after Germany won the bid in 2000. However, suspended FIFA President Sepp Blatter’s spokesman Klaus Stoehlker on Friday also disputed Niersbach’s assertions that the payment was arranged at a private meeting between Blatter and Franz Beckenbauer in January 2002. Beckenbauer himself has remained silent since the case broke out one week ago and cancelled a planned appearance at the opening the of the German football museum Friday attended by Niersbach and other DFB officials. His management said Thursday that Beckenbauer would be available to answer questions from a law firm hired by DFB to investigate the affair. Considered one of the best players of his generation, Beckenbauer won the World Cup both as captain and coach of West Germany. His international popularity and connections were thought to have a played a major role in bringing the World Cup to Germany. He toured the world to present Germany’s bid. Zwanziger was responsible for finances for the 2006 World Cup organizing committee. He and Niersbach have had several bitter feuds over the years. On Thursday, Niersbach told a news conference that the payment to FIFA was in return for a financial grant of 250 million Swiss francs to the 2006 World Cup organizing committee. Niersbach said Blatter and Beckenbauer made the deal at a private meeting and that the money was paid to FIFA by French businessman chief Robert Louis-Dreyfus. Louis-Dreyfus, the former Adidas chief who died in 2009, demanded the repayment of the loan and was paid back by the Germans one year before the tournament. But Zwanziger, in his comments to Spiegel, claimed the money in fact went to Mohamed Bin Hammam, the now disgraced former member of FIFA’s executive committee from Qatar, who at the time was supporting Blatter’s re-election bid. Zwanziger said he had learned about this through a telephone conversation this week with Horst R. Schmidt, who was the vice president of the 2006 organizing committee. Zwanziger did not say why the money went to Bin Hammam. 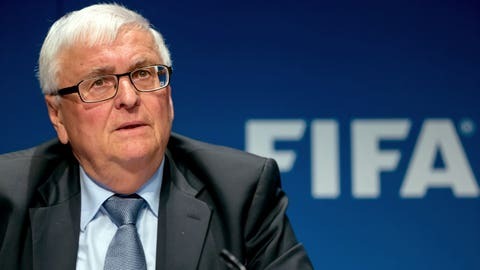 Also Friday, the DFB board stood behind Niersbach after a regular meeting, while demanding a full explanation of the case regardless of who might be involved and even if the truth leads to ”painful findings,” according Reinhard Rauball, a vice-president of the federation.